Trevor Presiloski (The Internet Trashcan) has a good piece on Henrik Sedin’s Hart chances. If you haven’t read it yet, make sure you pass by his site and do. Canucks fans – well most of them anyway – have long appreciated the Sedins’ production. While some may have continued to see them as second-liners or called them ‘sisters’ at the beginning of the season (despite being in the top 20 in the league in scoring for the last couple of seasons), I think even their most vocal critics will admit now that they have evolved into two of the best players in the NHL. Henrik, in particular, is having an MVP season. We all know the stats – 62 points (1st in NHL), 20 goals (9th in NHL), 42 assists (2nd in NHL), plus-19 rating (7th in NHL, 5th among all forwards), 46 even-strength points (1st in NHL) – but as Trevor points, Henrik has done this even with brother Daniel injured for 18 games (or 40%) of the season. What is most impressive about Henrik’s ascension to (relunctant) rock star status is that the Eastern-based media are beginning to notice. All of this is a long-winded way of saying that Ryan Miller might have been the player with the greatest impact in the first half, but a skater likely will emerge as the Hart winner. Miller has been superb, but we like Vancouver center Henrik Sedin. Playing without favorite left winger Daniel Sedin — have you noticed they share a resemblance? — Henrik carried the Canucks in his twin’s absence and then soared in December after Daniel returned. The playmaker that never has scored more than 22 goals in a season already has 19, eight more than San Jose’s Joe Thornton, who leads him in the points race by a mere two. Henrik Sedin, Canucks 20-38, plus-16 When twin brother Daniel broke his foot in October, Henrik stepped up and proved that he could carry the offence by himself. Henrik scored 10 goals and 18 points in the 17 games Daniel missed. Did you see that pass (link added)? Henrik Sedin’s slick feed in the second period of Saturday night’s Canucks/Flames tilt to his fellow wonder-twin, Daniel was as good a pass as there’s been in hockey in recent years. Magic Johnson didn’t pass like that. Heck, Tiger Woods doesn’t make passes like that. 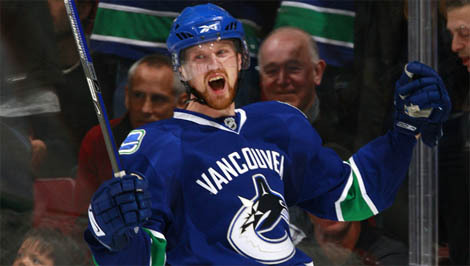 It also reaffirmed that Henrik Sedin is my choice right now for the NHL’s most valuable player. Well, the news of his play certainly makes it to the East Coast now. And if he keeps it up, the added attention will only help his Hart chances. Wow, hey. Thanks for the mention guys! Most appreciated!